This is the palace that Baldassare Longhena designed for the Bon family in 1649, but was still incomplete in 1682 when Longhena and his client died. In 1751, the Rezzonico family (financiers originally from Lombardy) bought the unfinished palace and commissioned Giorgio Massari to complete the works; by 1756 the building was complete. 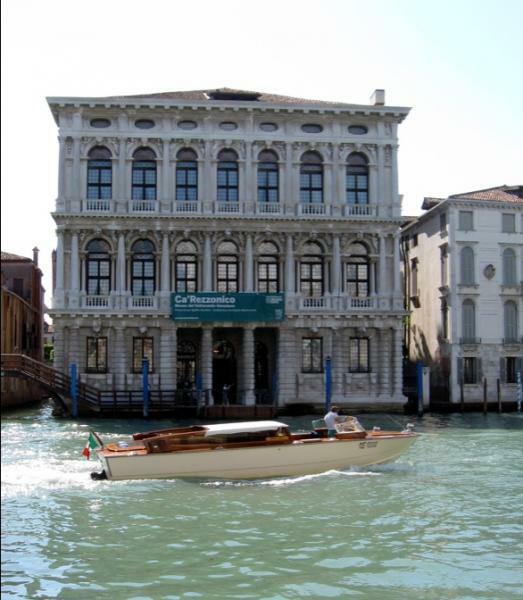 Massari followed Longhena's plan for the majestic Grand Canal facade, but added his own bits, including the land facade, grand ballroom and stair. Two years later, the brother of the Massari's Rezzonico patron was elected Pope Clement XIII, leading to the family's golden age. In the early 19th century, however, the family died off, and its furnishings were sold off, while the palace frequently exchanged owners. One was Robert Barrett 'Pen' Browning; in 1889, his father Robert Browning died while visiting. Graved inside of it ‘Italy’. One of the most charming objects stands on the Grand Stair leading up to the piano nobile – a droll putto dressed in a Russian hat and coat, by Juste Le Court. It opens up to the lavish ballroom, with a ceiling by Giambattista Crosto and a mind-boggling collection of rococo furniture by Andrea Brustolon of Belluno (1662–1732), whose chisel knew no bounds, either in craftsmanship or taste. The ceiling of the second room (on the right) was frescoed by Giambattista Tiepolo, celebrating an event of consummate social importance to the nouveau riche Rezzonici: the 1758 marriage of Ludovico Rezzonico to a Savorgnan bride (of such exalted status that she is driven by Apollo and Cupid in the chariot of the Sun). In the middle of the floor is the upper half of an old gondola, with window slats that close for complete privacy. One room is devoted to Rosalba Carriera’s pastel portraits of nobles; the library, with a display of books published in Venice, has ceiling frescoes by Francesco Maffei. The second floor offers more paintings, including two views by Canaletto (1697–1768), among the only ones left in Venice; scenes by Francesco Guardi (including the Ridotto and the famous salon held by the pretty nuns of San Zaccaria), and 34 of Pietro Longhi’s most endearing scenes of settecento Venice, populated by dwarfs, masked merrymakers, friars, invalids, lap dogs, plates of doughnuts (Carnival frittelle), charlatans, alchemists, the ‘giant Magrat’, washerwomen, tailors, hairdressers, and the famous rhinoceros that visited Venice in 1779 (which seems to have lacked a horn, but made a prodigious amount of rhino poo). Giambattista Piazzetta contributes a major piece of Venetian kitsch (The Death of Darius), and there’s a candy-coloured Interior of St Peter’s by Giampaolo Panini. The 18th-century interiors nearly all have authentic furnishings – the bedroom, boudoir and the Green Drawing Room, with lacquered Venetian chinoiserie. The last set of rooms on the second floor are the most delightful, with frescoes by Giandomenico Tiepolo taken from the Tiepolo family home, Villa Zianigo, near Mestre. 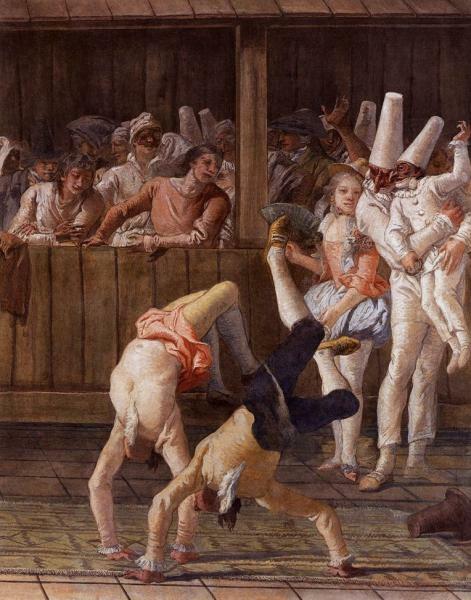 Painted in 1791, they are perhaps the last carefree hurrah before Venice’s dotage, but show no forebodings: in The New World the audience dresses up to see scenes from America; Commedia dell’Arte figures, acrobats, centaurs and satyrs sport on the walls as if tomorrow will never come. After substantial restoration work, the third floor now houses an important collection of paintings (from the late 16th–19th centuries) amassed by local antiques dealer Professor Esidio Martini and bequeathed to the city, as well as the magnificent 18th-century pharmacy, moved from near San Stae and full of its original porcelain and glass vessels.